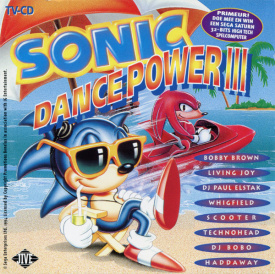 Sonic Dance Power III is the third in a series of tecno-dance compilation albums released in the Netherlands. Using the Sonic the Hedgehog brand on its packaging, the songs have nothing to do with Sonic or any SEGA related product. The front advertises a competition where you can win a Sega Saturn. This page was last edited on 27 January 2019, at 22:18.